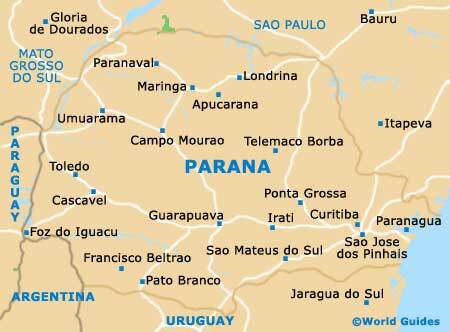 Not to be confused with the Brazilian city of the same name, the state of Paraná is, quite frankly, a tourist office's dream. On the whole, its cities are pleasant, offering a wealth of interesting things to see and do. Its rain forests are unspoiled and its beaches remain pristine. There are even geological wonders in abundance. What is more, economic development seems to have been kind to both the landscape and people here. Through the southern part of Paraná runs the great Rio Iguacu. Within floating distance of the mouth of this massive river are its famous waterfalls. Of the 20-odd bunch of falls, the most awe-inspiring sight has to be the Garganta do Diabo, a roar of water and spray that suits its name, which translates as 'Devil's Throat'. Around the Iguacu Falls is the national park, which was created to protect the surrounding landscape. Other water-based attractions in Paraná include the Itaipu Dam, a massive joint Brazilian-Paraguayan venture that supplies Brazil alone with nearly a fifth of its electricity needs. The building of the dam was a monumental effort in itself, involving 50 million tonnes of moved earth and some 40,000 workers. Paraná's main city of Curitiba sits on a plateau overlooking the Baia de Paranaguá, surrounded by the hills of Serra do Mar. It is one of the greenest cities in Brazil, being at its best at the end of the winter, when its pavements and parks are given a vivid splash of purple and yellow 'ipe' blossoms. Many of Curitiba's parks and monuments pay homage to the immigrants who have arrived in the city over the years, with names that range from Italian Woods to Japan Square. A sizable state capital, Curitiba is situated within Parana, being famed for its quality of life and well-developed infrastructure. Attractions in Curitiba include the eye-catching Oscar Niemeyer Museum and the Jardim Botanico (Botanic Gardens). Much of the appeal of Foz do Iguacu is down to its scenic setting. A backdrop of mountains is accompanied by lush jungles and several breathtaking waterfalls, including the famous Iguacu Falls - a true spectacle of nature.